PREMIERSHIP hero Shane Edwards will finish his career as a Richmond great after another blistering display on the big stage, according to coach Damien Hardwick. Edwards finished with a game-high 31 disposals, two goals and three direct score assists in the Tigers' Dreamtime at the 'G win, to stamp himself as the competition's No.1 set-up player. 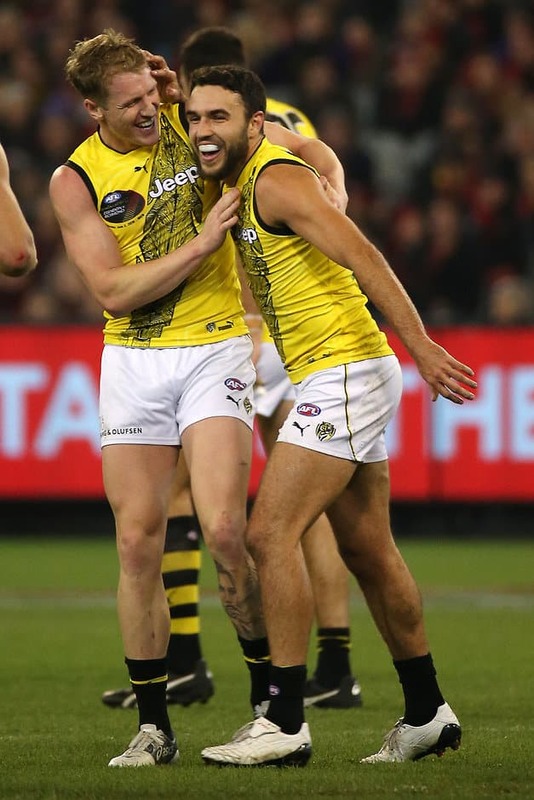 Richmond's only indigenous player in the match, Edwards did as he pleased in the second term before finishing as the runaway winner of his first Yiooken Award for best player on the ground. "He's got one thing that makes him an incredible talent and a very underrated talent in my view, he makes those around him better. "You look at his score assists on a weekly basis, not only this week but throughout his career. "He'll go down as one of the greats of our footy club, I reckon. "I've loved him ever since I got here, he's been such a terrific player for us and the club." One of the best in the Tigers' drought-breaking premiership last year, Edwards' ability to play one step ahead of his opponents impressed Hardwick most. "His ability to win the ball in the contest and get it to the guy on the outside, he skips a possession in between," Hardwick said. "Most players would see 'that one', he sees the one, one step on. That's a credit to him and a credit to his vision of the game. "We're fortunate to watch his 200-game highlights tape and it's just 'wow'. "There's things he can do that other players can't and that's why he's special." As the Tigers turn to the second half of their premiership defence at 9-2, Hardwick said they were as determined as ever to feature prominently in September. "They're very humble and they're very hungry," he said. "(Captain) Trent (Cotchin) leads from the front, (and) you've only got to look at Dustin, he just loves winning. If one of the best players in the competition loves winning and loves winning on a weekly basis, I don't need to probe these guys that much. "(They're) such a proud group, they respond accordingly when they need to and they raise the fight when they need to. I'm very lucky to coach such a quality group." Hardwick revealed young forward Callum Moore will be on the flight to take on Port Adelaide next week in what will be his third game for the season and fifth match of his career. The 21-year-old, who stands at 193cm, has partnered Jack Riewoldt in the key posts, keeping premiership forward Jacob Townsend out of the side, while Daniel Rioli works back from ankle surgery. "On form, we'll continue with it next week," Hardwick said. "But once again, it's horses for courses. "We've been pretty happy with how Jacob Townsend's performed from a role where he sits on an opponent and then gets offensive impact from that. "We'll assess that on a weekly basis, sometimes we just pick the players who are in the best form. "Cal's been in really good form, our VFL boys play tomorrow (Sunday), we'll see who puts their hand up and is ready to play again." Hardwick said his side would take learnings into their visit to the City of Churches, having lost convincingly to Adelaide at Adelaide Oval in round two this year.